Come join us for an evening of stunningly beautiful music that will create an atmosphere of calm in a society where we forget to stop and take time to listen. 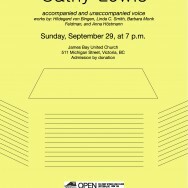 Open Space and Victoria’s listening series, A Place to Listen, have come together to present island songstress Cathy Lewis in a concert that brings together both the old and the new. Starting with the unaccompanied voice, Lewis will commune with the past singing chants by Hildegard von Bingen and Linda C. Smith’s sappho songs. Bringing us to the present will be Barbara Monk Feldman’s The Gentlest Chord. Also on this concert will be Linda C. Smith’s each petal and Anna Höstmann’s What her friend said, both written specifically for Lewis. Open Space is an artist-run contemporary arts centre in downtown Victoria that presents new work in the visual, sound and music, literary, and media arts.